Successfully Added Golf 1000 Pro Laser Range Finder - 1000m Range, 1.8 Inch LCD Screen, Goniometer, Flagpole Lock, Fog Mode, Weatherproof to your Shopping Cart. The Golf 1000 Pro from Laser Works is a laser range finder for golf and brings all the telemetry you could need to the golf course. With a ranging mode from 5 to 1000 meters and flagpole lock this pro golf accessory gives you a precision measurement to the pin. It can even compensate for gradients, and substitute this into the distance calculations so you can see the recommended distance, ensuring you won’t over or under hit the ball when heading up or down a gradient. The flagpole lock will pick out the pin from its surroundings, so even if you can’t clearly make it our though the 6 times magnification lens this smart rangefinder will come to your aid and guide you to the green. All this data is clearly presented on a 1.8 inch LCD display and can also be viewed through the lens of the rangefinder. This 1000m laser range finer is your golf caddy replacement, bringing the best information to aid you in every shot. So whether you're a budding amateur or keen professional you should never tee off without this golf caddy laser range finder by your side. 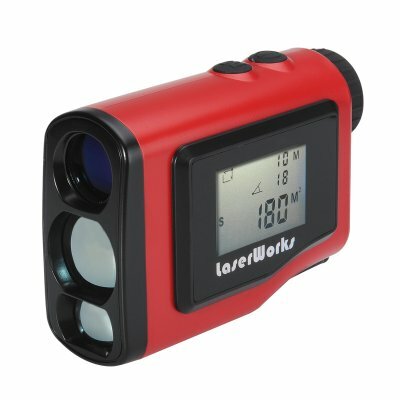 This golf laser range finder comes with a 12 months warranty, brought to you by the leader in electronic devices as well as wholesale sports and outdoor gadgets..